Back in the late 1980s, when Spoleto USA was only about a decade old, I was enjoying one of the programs in the chamber music series that Charles Wadsworth organized for the festival and which became, over time, one of its most popular and consistently successful features. Wadsworth, the ever-avuncular host, had just introduced to the Dock Street Theatre stage a teenaged phenomenon named Matt Haimovitz, whom he predicted would soon leave his mark on the cello repertoire. Well, it is now about 25 years later, and Wadsworth’s forecast has certainly come true. A native of Israel whose parents immigrated to California when he was only 5, Haimovitz has charted new paths for his chosen instrument by transcending the parameters of his classical training. A fixture on the concert stage, collaborating around the world with major orchestras and chamber groups in the performance of works by such musical giants as Bach and Haydn, and the purveyor of six highly acclaimed recordings for the Deutsche Grammaphon label, Haimovitz has branched out to embrace what might be called “the new music,” the work of living composers, and to play in venues not normally associated with someone with his credentials – he played Bach cellos suites at the notorious CBGB Club in New York City. The same impetus informs the career of Christopher O’Riley, who is most familiar to the listening public as the host of National Public Radio’s “From the Top,” which features performances by and interviews with talented young musicians. A Chicago native with classical music credentials as impressive as those of Matt Haimovitz, O’Riley likes to break barriers; in fact, his most notable recording to date is a 2003 CD that features his piano transcriptions of works by Radiohead and other alternative rock bands. 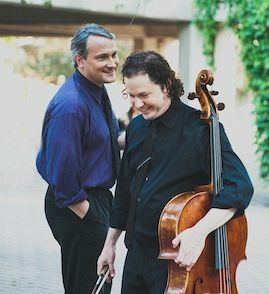 This coming Thursday, both Haimovitz and O’Riley share their eclectic musical artistry with an Aiken audience as part of the 2013-14 USCA Cultural Series. Entitled “Shuffle, Play, Listen,” their program will follow the general organizing principle of their critically acclaimed 2011 two-disc CD of the same name – creating an intriguing mélange of both classical and popular music. The evening’s selections will be announced from the stage with some context provided by the performers, but one thing is sure, most of the pieces will come from their landmark CD. Here are some possible choices. The recording opens with a haunting arrangement of Bernard Hermann’s music for the Alfred Hitchcock film “Vertigo.” Hermann wrote and conducted most of the music for Hitchcock’s films, and he counted the work that he did on “Vertigo” among his best. The Oct. 10 concert may likely include movements from the “Vertigo Suite” as well as music composed for the dance. Featured on the CD are five movements from Igor Stravinsky’s “Suite Italienne,” which he based on the score originally written for his 1920 ballet “Pulcinella,” commissioned by Sergei Diaghilev for the legendary Ballets Russes. Another dance form previously explored by Haimovitz and O’Riley is “Le Grand Tango” by Astor Piazzolla, who took the music most associated with his native Argentina and raised it to new levels of complexity and sophistication. Among the less rarefied selections may be “Empty Room” by the Canadian group Arcade Fire, who won the Grammy for “Best Album of the Year” in 2011; the piano-driven “Pyramid Song” (2001) by the English band Radiohead, and “A Lotus on Irish Streams” by jazz fusion icon John McLaughlin, perhaps most popularly associated with the group that he founded in the 1970s, the Mahavishnu Orchestra. Honored by the Greater Augusta Arts Council with its 2013 Media Award for his long career as a cultural affairs columnist, Dr. Tom Mack currently holds the G. L. Toole Chair at USC Aiken.